Drum Handling includes equipment to specifically lift, transport, dispense, and store steel, poly, and fiber drums. 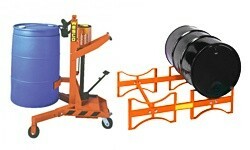 Find every drum solution like a lifter to raise the load; a drum truck to move it; and a drum rack for optimum storage. Facility Maintenance & Safety equipment ensures long-lasting indoor or outdoor protection. 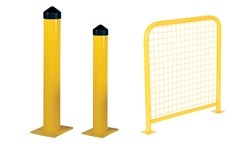 Warn workers and pedestrians of potential hazards by setting up bollards, beams, crowd barriers, and machinery guards. 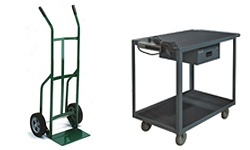 Hand Trucks, Carts, Dollies include delivery and materials handling hand trucks, carts, and dollies for commercial use. 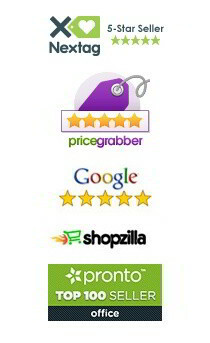 Various models, features, and options are available. Lift Equipment for warehouses and factories allow workers to efficiently move, store, and rearrange pallets, bulk shipments, materials, heavy machinery, and more. 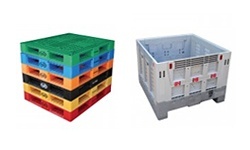 Pallets & Containers are available in a variety of shapes and sizes. Pallets and skids are constructed of plastic, steel, aluminum, and more. Storage containers are collapsible or foldable for easy storage. Personal Protective Equipment includes face, lung, ear, and eye protection to keep workers safe. 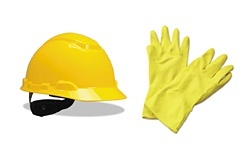 A large selection of safety apparel, hard hats, caps, cleaning gloves, exam gloves, and work gloves are available. Well suited for a wide assortment of tasks. Safety Cans & Containers allow for safe and easy pouring for numerous applications. 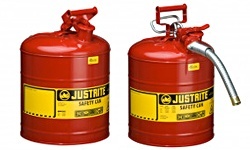 Most type I and II, DOT, and oily waste cans meet OSHA and NFPA code 30 requirements. Models come in a variety of colors and capacities. 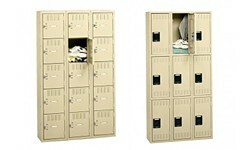 Safety Storage Cabinets comply with federal and state regulations. 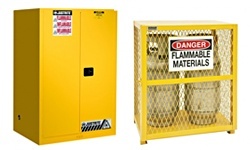 Safely store flammable liquids, combustible liquids, acids, and pesticides in a high-quality, durable manual or self-closing cabinet. Scales & Balances measure weight and mass for settings including laboratories and warehouses. Parts counting, percentage weighing, and check weighing available. 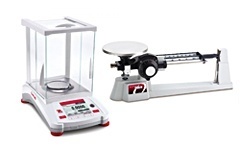 Measure small samples using precision balances up to oversized loads using floor scales. Shelving & Racks are available in multiple sizes to match your storage requirements. Durable shelving and rack systems help keep businesses clean and organized. 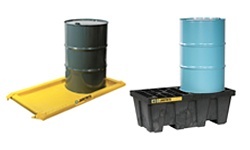 Spill Containment & Control products protect against unwanted spills whether inside or outside the facility. Berms, drain covers, and pop-up pools help keep the workplace safe by collecting hazardous waste that would otherwise cause damage. Storage Lockers feature heavy duty steel construction and vandal-resistant recessed handles for secure storage of clothing and personal belongings. Wardrobe & Storage Cabinets for office, industrial, or general storage. Cabinets feature quality construction, three-point locks, and long-term security. 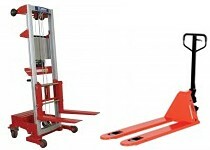 Warehouse & Dock Equipment improve the efficiency and safety of dock loading and warehouse work. 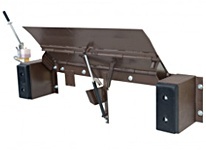 Make it easier to unload trailers using hand trucks with dock plates and boards. Increase dock visibility using dock loading lights. Raise trailers that extra bit with the help of trailer stabilizing jacks. 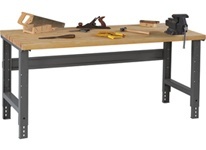 Workbenches are a complete system designed for the rigors of the factory floor. Select from all purpose, mobile, and electronic work benches as well as technical workstations in various sizes and surfaces to fit your particular needs.